An NDSU student, Colleen Nazzaro who lives in University Village, created an indoor garden. This will help her save money in the long run and help pressure her into a healthier lifestyle. Nazzaro, originally from Waconia, Minnesota, is a junior majoring in mechanical engineering. This is her second year living in University Village. She has always enjoyed gardening and grew up watching her father garden, so she is knowledgeable about what errors to avoid when planting. 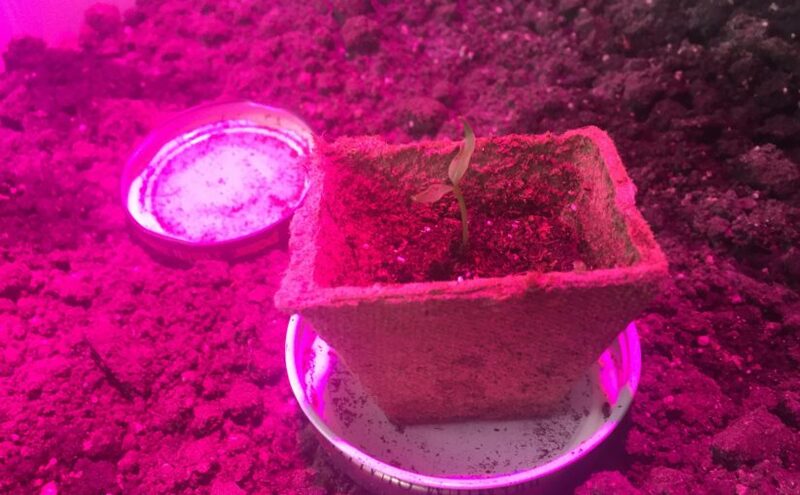 When beginning the indoor garden, she had a concern about how much light the plant would be able to receive. This is understandable, since most apartments, especially University Village, do not get much sunlight. She made a mistake last year when planting herbs in her windowsill. Once winter hit Fargo, they began to die. She learned from this and is keeping her garden away from the windows. She bought a grow light to help out instead. “A lot of people get that confused with a UV light, but in reality if you just give them only UV light waves then they (the plants) die,” Nazzaro explained. The walls get cold in University Village, so to keep her plants alive she plans to make an insolation box. 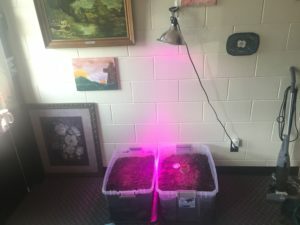 The grow light set up to create light for her garden. “I kind of DIYed it and winged it, so I was actually really surprised when I saw sprouts come up,” Nazzaro said. She decided on onions and peppers because they are basic vegetables and hearty, so they are able to grow indoors easily. Second: Get soil, which is pretty cheap. 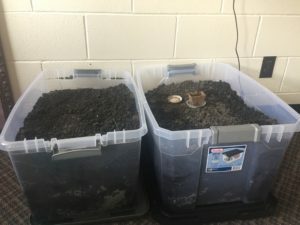 She decided on four bags of soil, because she is making it a medium sized indoor garden. Make sure to get the chunks out and make the soil nice and smooth. Third: Get the seeds. Nazzaro decided to start with bell peppers and Spanish yellow onions. Awaiting for more growth from indoor garden. In the future she hopes to plant more hearty vegetables. She thinks about squash and potatoes specifically. A benefit of indoor gardening is the pressure of needing to eat healthier. “I always thought of it as — this is something that I paid for — I invested my time, my money and a few hours of preplanning,” Nazzaro explained. Another benefit of indoor gardening could be the potential to save more money while in college. She believes that in the long run it will help her save money. She won’t be going out to buy vegetables because she will have them right there in her room. It’s more of a long-term saving process, so she has to be patient. When giving advice on what the most important factors of indoor gardening, Nazzaro believes that people should “make sure you get the right light, so don’t skip out on the light.” She got hers for about $15, so it is not too expensive. She explains that a constant temperature is very important as well.